President Obama's recent statement saying that requiring Iran to recognize Israel would not be part of the agreement with Iran did not surprise Israelis, many of whom feel that the more he tries to assuage their fears, the more they have to worry about. As president of the United States, his first commitment is to the welfare of his country, but it would not have been out of place for him to demand that Iran publicly declare it would not destroy Israel, one of America's closest allies. Obama is clearly aware of Israel's concerns, promising the United States would "be there" for Israel, but where is "there?" When the time comes and Iran does in fact have the bomb, what will his promises be worth, and who will be responsible for keeping them? In the shadow of the agreement, which in any case is full of contradictions and mutual accusations, lies and fraud, and still includes centrifuges, long-range missiles, yellowcake uranium, heavy water facilities and underground bunkers, Iran will continue its military and nuclear buildup without even a nod to retreating from its plan to destroy Israel. Congress is making a rare bipartisan attempt to pick up the pieces and get a majority to vote down the curious agreement and even override a presidential veto. While Obama persists in deluding himself and others, there are many who in fact take Israel's warning about the danger posed by a nuclear Iran seriously. In the meantime, to the American administration's displeasure, Congress is proposing means for oversight and a way to re-impose sanctions on Iran, extracting itself from the straitjacket Obama wants it to wear. So far, that effort includes defining a time frame for inspection to ensure that the Iranians are fulfilling the minimum requirements as conditions for confirming the agreement along with the possibility of calling it a less-binding "convention." Those tentative steps, praiseworthy as they may be, do not take into consideration the skill of the Ayatollahs and their agents to manipulate, conceal and distort, as well as their endless patience in finding ways to dupe the hapless inspectors, who will wander around Iran like lost sheep. Are there any practical implications for Obama's promise to "be there" for Israel if it is attacked? If the entire Middle East, Iran, the Arabs, the Israelis, share one sentiment, it is their unwavering skepticism regarding the Obama administration's willingness to intervene in regional crises. In light of the damage done to America's economy and in light of the losses suffered in Iraq and Afghanistan, it is generally conceded that Obama will not fling himself headlong into any Middle Eastern military confrontation in the foreseeable future. The violence and terrorism his new Iranian partners have employed in the Middle East without provoking any reasonable American response indicate that Obama has taken a backseat. Obama inherited a series of American failures, such as the North Korean nuclear bomb and the overthrow of the Shah of Iran, but he has his own personal collection: he failed by not understanding the essence of Islamism and by fantasizing about a "moderate" Islam; he made a disastrous speech in Cairo in 2009, making him the laughing stock of the Middle East; he failed in Iraq where the Americans and the Iranians support the Shi'ite militias as they slaughter Sunnis. His measures against ISIS and the other Islamists indirectly strengthen Iran, Hizballah, and the Assad regime and its Russian allies. Obama failed to stop the slaughter in Syria and the Assad regime's use of chemical weapons. He failed when he overthrew Mubarak, replaced him with the Muslim Brotherhood's Mohammed Morsi, and then did not support the more moderate Sisi when he took control of the government. He failed by not understanding that Turkey's Erdogan was an Islamist dictator with an imperialist agenda and supported Hamas and ISIS. He failed when he did not stop Putin in the Ukraine and the Middle East, when he did not support his Arab allies in Yemen and other regional crises, and did not even stand by the criteria he himself instituted for dealing with the Iranians. It is hard to know on which side Obama stands, with America's veteran allies such as Israel and the moderate Arab states, or with Iran, the force coming to power at their expense. His frenzied measures, some of which damage American interests, are a riddle for many. Even the many contradictions in the proposed Iranian agreement indicate that its remaining nuclear capabilities will allow it to build a bomb, this time with the sanction of the Western powers, over the next ten years. The gun is on the table, it just isn't smoking yet. Clearly, it is no longer a question of whether the Iranians will develop a nuclear bomb, but when. Time is not important for the Obama administration, which wants only to finish its term with something, anything, to justify the mysterious Nobel Peace Prize Obama received. For Israel and the Sunni Arab states, the next 10 or 15 years given Iran to build its bombs will pass like nanoseconds. Action that puts off the inevitable until Obama leaves the Oval Office is a classic case of "après moi le déluge," abandoning the Middle East to the tender mercies of Iran and an inevitable nuclear arms race and confrontation. 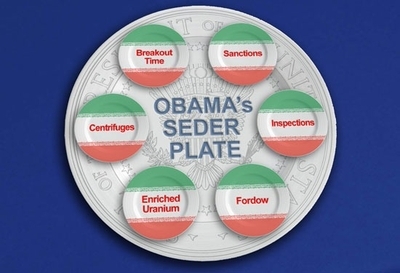 During the White House Passover Seder, Obama sent his blessings to the Jews around the world. He said that the Exodus from ancient Egypt, the journey of the Israelites to freedom, meant choosing "faith over fear, courage over complacency." It reminds us, he said, that "there is always a reason to hope," and he somehow managed to wedge the civil rights movement into the picture. Such exalted humanistic declarations applied to the agreement with Iran are ludicrous. In the Biblical account Pharaoh was overcome and the Jews were saved. In contrast, the agreement with Iran gives the Ayatollahs, the Iranian Pharaohs, international license to manufacture bombs to destroy the Jews. Moreover, the Exodus occurred only after Pharaoh paid no attention to the first plagues sent by God, warning of what would happen if he did not free the Jews and allow them to return to their homeland, Israel. What should be learned from the Exodus is the wisdom of Netanyahu's proposal for increasing the sanctions on Iran. They are the culmination of the necessary warnings sent to any evil entity and certainly to Iran. Thus, as it is written in both the Old Testament and the Passover Haggadah, only when Pharaoh refused, regardless of the warnings, to free the Jews, did God bring the tenth plague on the Egyptians, and all the firstborn of Egypt were killed. If Obama had gradually increased the sanctions on Iran, now would be the time to use the lesson of Egypt. According to the Bible, only if Khamenei hardened his heart would bunker-penetrating bombs be launched against Tehran. Even today, that is still possible. The Exodus of the Israelites to the Promised Land was not a matter of concession, fear or appeasement, like Obama's mistaken interpretation. It was strong-willed, fearless, and determined, and the Israelites smote those seeking to kill them, down to the last one. Obama's twisting of the account reveals the extent of his ignorance of both the true nature of the Iranians and how determined and deadly they are, and, unfortunately, of the real history of his Israeli allies. The Obama administration has not yet understood that the Iranians plan to develop a nuclear bomb and to use it to realize their ambition to achieve regional expansion and hegemony. The Islamist clerics sanction the use of chemical and biological warfare, relying, irony of ironies, on the 10 plagues, and on Islamic history, according to which Muhammad used vermin, snakes and scorpions to attack the "infidel" city of Taif. According to Islamic doctrine, Islam should always pay its enemies back in kind, so its twisted logic decrees that if the Americans used the atomic bomb against Japan, Iran can use it against the Americans. The American administration has deluded itself into thinking that the Iranians, who already are denying or falsifying the details of the agreement, will abort their pan-Middle Eastern imperialistic ambitions. The administration is trying to sell the entire Middle East the fairy tale that the Iranian regime, which invested billions – if not trillions – of dollars in bunkers, centrifuges and uranium, had its nuclear scientists assassinated, had its population starved through sanctions, developed missiles, weaponry and an army, and stands poised to buy cutting-edge Russian anti-aircraft missiles, is now willing to toss it all away to justify Obama's next Nobel Peace Prize or because Obama and Kerry were such charismatic dinner companions in Lausanne. The above article says that Obama is highly incompetent and doesn't know what the hell he's doing. I have another explanation: His true underlying motivations for what he does are quite sinister. To begin with Obama is not and never was a Christian. His actions and public statements leave little doubt that he sympathizes with those who are using the Quran to justify mass killings, beheadings, wife-beatings and various other atrocities. Releasing 5 terrorists kingpins to free a deserter? Imposing unrealistic demands on Israel that would virtually guarantee Israel's extinction? Going out golfing when ISIL beheads huge numbers of perfectly innocent people? Using American tax dollars in a failed attempt to remove Benjamin Netanyahu from power? Directing ICE to not enforce our immigration laws? Lecturing Christians about their past evils when ISIL kills huge numbers of them? Undermining law enforcement agencies which will be needed to protect us from terrorists? Does any of this make sense? It all makes perfect sense if you believe that President Obama is a fundamentalist Muslim who hates Jews and Christians bitterly and wants Islam to be protected fully against "blasphemy"..
Golda Meir to President Nixon : "By the time you get here, we won't be here"